NASHVILLE, Tenn. —At a press conference held Wednesday, it was announced that The Oak Ridge Boys will be inducted into the Country Music Hall of Fame in fall of 2015. The group was selected as the 2015 Modern Era Artist Inductees. A number of Country Music Association, Country Music Hall of Fame and other country music notables, including CMA CEO Sarah Trahern and Hall of Fame Director/CEO Kyle Young, gathered early Wednesday morning for the announcement. The Oaks were introduced to media and industry executives in the Rotunda of the Country Music Hall of Fame by their longtime friend and fellow entertainer Brenda Lee. Also present for the announcement was the Oaks’ manager, Jim Halsey, members of The Oak Ridge Boys’ staff and a few business associates. The announcement to the media, which was followed by an industry luncheon where several hundred had gathered, was streamed live. Primary on each of the Oak Ridge Boys’ list of thank yous at today’s announcement were their fans, who have supported them for more than 40 years while the group has made country and gospel music history. Few country music groups have had the enduring popularity, cultural significance or crossover success of The Oak Ridge Boys, a vocal harmony quartet that started out in gospel music during World War II and evolved with the times to help popularize and modernize country and gospel music far beyond traditional genre and regional lines. The Oaks landed their first No. 1, “I’ll Be True To You,” on the country chart in 1978, and perhaps just as significantly Paul Simon asked the group to sing backup on what would become his hit “Slip Slidin’ Away,” opening the door to the pop world for the group. Simon wasn’t the only one to lean on their harmony. They accompanied Brenda Lee on her GRAMMY® Award-nominated “Broken Trust” (1980) and George Jones on his country smash “Same Ole Me” (1982); and they also have harmonized behind Johnny Cash, Ray Charles, Billy Ray Cyrus, Bill Monroe and Leon Russell among many others. National audiences learned the joy of The Oaks’ harmonies when the group’s biggest hit, 1981’s “Elvira,” became a crossover pop smash with bass singer Sterban’s unforgettable “oom papa oom papa mau mau” refrain. The song brought them one of their five GRAMMY® Awards, went double platinum and helped bring much-needed fun to a genre that had a reputation for weepers and hard times. The inescapable “Elvira” propelled The Oaks’ 1981 album Fancy Free to double platinum. They followed a year later with another crossover hit, “Bobbie Sue,” and the album of the same title went gold as have many others in the group’s catalogue. Their 1980 and 1984 Greatest Hits albums are platinum. All in all, the current lineup has scored 17 No. 1 hits, released more than 40 albums and achieved sales in excess of $41 million. The Oak Ridge Boys’ “American Made” became a national ad jingle, and their “Thank God for Kids” is considered a country standard. The group also helped open the doors for country music on network television with a number of national televised concerts including HBO and PBS specials and as hosts and performers on primetime. They hosted their own series, “The Oak Ridge Boys Live from Las Vegas,” for TNN in the late 1990s. The Oak Ridge Boys – the rebranded group – have received 15 CMA Awards nominations and won two: Vocal Group of the Year in 1978 and Single of the Year in 1981 for “Elvira” (the group’s backing band won CMA Instrumental Group of the Year in 1978 and 1986). The Oaks were inducted into the Gospel Music Hall of Fame in 2000; Bonsall and Sterban were inducted into the Philadelphia Music Alliance Walk of Fame in 1994. Golden received the Alabama Music Hall of Fame’s Life Work Award for Performing Achievement in 1997, and Allen was honored with induction into the Texas Country Music Hall of Fame in 2014. 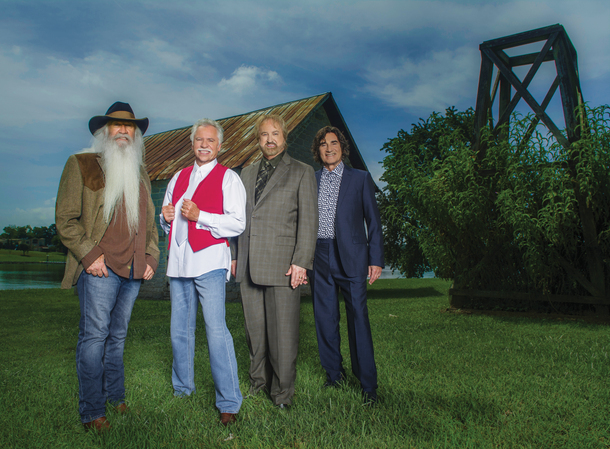 The Oak Ridge Boys have participated in decades of philanthropic endeavors including Feed the Children, the Boy Scouts of America and the National Committee for the Prevention of Child Abuse. For further information visit www.oakridgeboys.com or www.facebook.com/oakridgeboys.